Greek coin, Drachma jewelry, Brass Earrings, Owl jewelry, one of a kind earrings, Drachma Earrings, Athena jewelry, Goddess of Wisdom. Brass Greek Drachma from Greece with brass bullets as the post backs connected with silver wire. This one of a kind pair is handmade in the USA by The Fun Company. 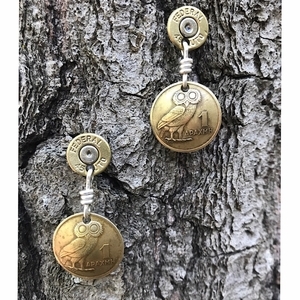 The Drachma represents Athena and the Goddess of Wisdom, This pair is approximately 2 inches long.